Wilson Chilled Water Buffer Tanks (CWBT) are designed specifically for chilled water systems. Designed and built to AS1210 Pressure Vessel Code, Haz E. These heavy duty commercial stainless steel vessels are available in options of polyurethane or polystyrene, foil coated, vapour sealed insulation to comply to Section J of BCA code. 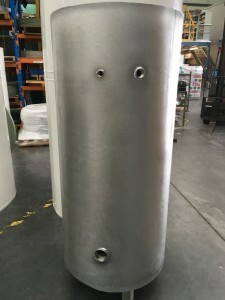 The Chilled Water Buffer Tank is then surrounded by an attractive colorbond outercase with the option to upgrade to aluminium or stainless steel. The properly sized CWBT is the perfect solution to rectify low level water conditions which occurs from insufficient water volume to chiller capacity ratio. This additional “buffer” capacity adds the necessary volume capacity required to eliminate problems such as; excessive chiller cycling, poor temperature control or erratic system operation. Standard vessels are manufactured in stainless steel and therefore not susceptible to corrosion problems due to high condensation, especially in higher humidity climates. Wilson stainless steel Chilled Water Buffer Tanks need no additional coatings or treatment and therefore are an in-expensive alternative to mild steel for your specification. Custom built to your requirements including options of flanged connections sized up to 300mm NB. Wilson manufacture to your requirements.